My daughter was up over the weekend and telling her about my aches and pains, she said I should see a chiropractor. She had the same type of aches and migraines, found a chiropractor in Annapolis that worked her over and the migraines disappeared and so did her aches. So Mom has to do what daughter says now. It's turn the tables when we get this age. I had to go to a funeral Monday morning and when I got home my husband said he had found a doctor that I could see in the morning and I should call and talk to her. He'd just looked in the phone book and called a couple asking if they took Medicare patients. This one did so I called. Went in for a consultation. Sure was different than any doctor's office I've been in. The receptionist came in and he dictated to her what he wanted to be written down. He said it was not muscular but the lower disk problem and would want X-Rays to see just what was going on before doing anything. So off I went across the street to the Diagnostic Imaging for X-Rays of my lower back. So will see. I have another appointment on Friday. Stay tuned. Later found out that my friend Roben had gone to this Doctor and he said right away what her problem was. Treated her and she was pleased. So nice to know someone else who had gone to him. But I did finally finished the binding on my Orange Crush mystery quilt that Bonnie had a few months ago. I had sent it to Florida so my friend Patty could quilt it. She did a terrific job with an all-over design. Now my daughter has asked for it, as they have three cats that like to sleep with her and she doesn't want them on her good quilts. Can't blame her and the cat hair sure won't hurt this quilt. Besides some of the fabric I used was hers. Like the orange. The backing is what was left of the orange and blue dot. Hubby is doing as good as can be expected. We have had some very cold weather. Was below freezing last night. Did warm up today with the sun shinning but they are still calling for some snow, maybe. Had flurries the other day. Don't need snow yet. I have running to do on Thursday and Friday. Every day this week. Haven't even had much time to read any blogs. Thanks for visiting and hope you can leave a comment. I like to know when you visit. Just wanted to say hi and to let you know that I am still reading. The chiropractor has been treating my daughter and I for migraines and disc problems for several years, I don't know what I would do without him! Oh, yes I do...I'd still be taking Topamax trying to prevent migraines and I've been able to be off of it for several years! I hope you have as much success as I have! I certainly hope you find something or someone to cure your aches and pains. My husband went to the acupuncturist! I was shocked that he went, but it seemed to do him some good. The doctor or chiropractor did not help him. Sure hope you are OK and get some rest time, I know you work hard! Hi. :) Just wanted to delurk and let you know I loved the quilt picture...hope the chiropractor helps. It sounds like you are having a busy time - sometimes life is just like that- there is one thing to deal with after another- I hope the doctor can help you get rid of some of those aches and pains- they don't sound too fun. It always makes me feel better when I know someone who talks positively about their doctor experiences. Your orange crush turned out so nicely. I am sorry for your loss- giving the loved ones left behind support is a real act of kindness. I am fortunate to have both my parents still but I know they sometimes find themselves going to funerals way too frequently..They are in their 70's and in reasonably good health . Take care of yourself lovely lady- I will be back to catch up with your news. I am glad that you are working on getting help with your aches and pains. Sounds like the mom needs some looking after. 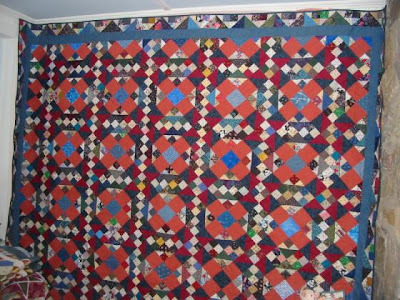 Your quilt is grand, Well done. You are a sweet lady and have a star waiting for you in heaven. Hope that the chiropractor helps you with those migraines. they are not nice. You are going to town as usual!Your OC is great, and I love the ChexxMix also. Hope your new dr helps with the back. See Mom, the chiropractor really can help! The absence of my headaches has given me my life back! Wish it would have helped Dad more when he went. See you Friday! I love your Orange Crush. I made it too, but haven't gotten my quilted yet. Yours turned out really beautiful.